How many magnetic lifters (like those containing shabu) were imported into Manila since Duterte came to power? Blue Ribbon Committee chair Senator Richard Gordon asked Bureau of Custom officials that question. So did former Bureau of Customs Commissioner Ruffy Biazon. Both men, during separate probes in the House of Representatives and in the Senate, on the multi-billion pesos worth of shabu smuggled inside magnetic lifters, got no answer. Both men demanded the answers. To this day, none has been given. Before President Rodrigo Duterte came into office, it would have been easy to get those answers simply by clicking on the Bureau of Customs website. John Sevilla, when he was Customs Commissioner, had started uploading all the imports coming into the country in excel files. The excel files even indicated whether a particular shipment was misdeclared and what Customs did about it. When Duterte became president, the practice was discontinued and the excel files that were already uploaded vanished from the BOC website. I can understand that illegal drugs are being smuggled into the country, secretly offloaded from ships at sea and picked up by Filipino partners. But what simply boggles the mind is how NEARLY TWO TONNES of shabu in SIX magnetic lifters could have sailed through Customs, under the “watchful” eyes of the Customs officials. I mean, have you ever tried getting a small package from the post office sent to you as a “gift” from overseas? I remember trying to claim a package that went a wee bit over US$50 in value. It was something like US$54. The beady-eyed Customs officer told me I had to pay P2,000 to claim it. They are THAT CAREFUL IN EXAMINING A SMALL PACKAGE THAT CONTAINED A BOOK, A PART OF A COMPUTER AND SOME GADGET. But with nearly two tonnes of shabu worth nearly P12 billion pesos. My gosh, these simply sailed through Customs. One shipment of two magnetic lifters was found ABANDONED in a warehouse after Customs cleared it, still containing shabu The other shipment of four magnetic lifters was found ABANDONED, but no longer containing shabu. Now contrast that with what is happening in the streets in Duterte’s war on drugs. Thousands are being killed for possessing drugs, many of them for having JUST ONE SACHET OF SHABU. One SACHET, you get the death penalty. Being unable to stop nearly TWO TONNES from entering the country, one government official got a promotion, the other got the President to be his baby’s ninong. And that’s why Alan decided to find out more about the magnetic lifters containing shabu. What do shady operatives, whistle-blowers, X-ray scanners, and a US$205 million drug haul have in common? It started like a drug-war police thriller. Now it’s playing like a farce, with bumbling agents pointing fingers at each other and an exasperated President Rodrigo Duterte looking hapless, sacking officials and calling in the army. The plot includes shady operatives, whistle-blowers, X-ray scanners, sniffer dogs – and a colossal shipment of drugs with a value beggaring belief. 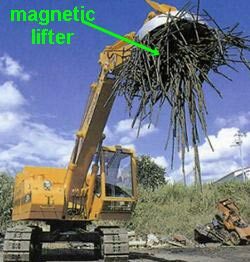 At the heart of the story are magnetic lifters, the massive, circular steel plates attached to cranes to move scrap metal. On August 7, law enforcement officers acting on a tip converged on a container van at the Manila International Container Terminal. Inside the container, which was declared to be a shipment of door frames, were two magnetic lifters. Hidden inside them was 355kg of shabu, the local term for crystal meth, with a street value of at least 2.4 billion Philippine pesos (US$44.77 million). It was a jackpot – and agents of the Philippine Drug Enforcement Agency (PDEA) and the Bureau of Customs (BOC) had reason to congratulate themselves. Unbeknown to the team, however, a far bigger prize had eluded them. Someone who saw a television report on the raid reported that, weeks previously, he had helped bring four similar-looking magnetic lifters to a warehouse in Cavite City, south of Manila. But when operatives raced to the location on August 10, they were too late. In the deserted warehouse were four abandoned magnetic lifters, each with a neat square cut into the flat surface. Trained sniffer dogs found traces of shabu in the cavities. They had been emptied on July 15, more than three weeks before they were discovered by agents. The PDEA initially estimated the lifters contained one tonne of shabu, valued at 6.8 billion pesos. A closer look revealed they had been specially modified to carry drugs and the actual load was 1.68 tonnes – or 11 billion pesos. So much shabu entered the market that prices in Manila fell – on television, PDEA director general Aaron Aquino said shabu, which used to cost 6,600 pesos per gramme, now went for 1,600 to 2,000 pesos per gram. “The shabu is now on the streets, being used,” he said. It is a dubious company. Oracle has confirmed the findings of the original story. my sister in australia said china got kicked in the teeth. australia refused to sell to china it’s natural gaps pipeline. china offered billions, but australia refused. also, australia refused to buy china’s hik cctvs for use around military bases, etc. apparently, china can spy through the cctvs, may spyware pala, recording people, their conversations and all. stealing data is china’s specialty as well as sabotaging operations and hacking them for their own use. Si Lapena ang drug lord na protektado ni Dutae !!! Si Dutae demonio !!! BOC is like EDSA – both are insoluble at present but who knows in the near foreseeable future – a miracle may happen, especially at the BOC. What is needed at the helm of BOC is a moneyed leader who won’t need dirty money – and that leader is Gina Lopez, an environmentalist and philanthropist and incumbent chairperson of the Pasig River Rehabilitation Commission. begging your pardon po, what is needed in boc is a president who keeps his words, means every words he said and one that makes the punishment count. kaso, this president is in love with square one and stays there, glued to the eyeballs siya, he, he, he. square two beckons pero more comfortable siya sa square one, not budging talaga. stuck by magnetic lifters, he, he, he. papatayin kuno niya ang kurap, sasampalin kuno ang kurap, words and more flowery words, kurap as in general noun with no one in particular. but when general noun kurap becomes personal noun kurap complete with faces and names and status, aba his ‘this is it moment!’ ay naging ‘this cannot be it’ moment. kilala pala niya ang kurap, appointee pala niya, tapos kaibigan pang matalik! worst, anak pala niya and sangkot sa kakurapan, drug lord cartel extraordinaire! and what did mukhang uling do? protected them big time. shifted his appointees, salve their egos as well as his own, and give them choicest jobs. happy siya if they’re happy. kaya, problems are blooming and flourishing and mushrooming nationwide and mukhang uling is in the middle of it, and happily so. for problems to be solved, mukhang uling has to mean what he says and make punishment count, else nothing happen sa boc, business as usual, with our without gina lopez. it’s not really gina lopez who should be making sacrifices, it’s mukhang uling’s call to make sacrifices. can he sacrifice his friends? can he punish them? can he afford to be without his corrupt friends? can he stop corrupting his already kurap friends? it takes courage to stand up to your enemies and it takes more courage to stand up to your friends. Pero sa realidad mahirap baguhin ang ganyan kalakaran. May mga tauhan naman na malinis pero kung lahat sa paligid nya madumi, madudumihan din sya. Kahit ayaw nya kung ang mas nakakataas sa kanya ay madumi, wala sya magagawa kundi makikisama para di sya mapaginitan o masama pa gawan ng kaso kasi walang “pakisama”. Ang kawawang tapat na empleyado pikit mata na lang o tatahimik o para wala ng kawala isasali na din sya. Sabi nga madalas ay damay-damay na. Isipin nya kung lahat sila nakikinabang ako din dapat. Nakakalungkot at nakakagalit pero yan ang tunay na nangyayari. there are those considered ‘harmless’ in customs doing their jobs and keeping their heads down, their noses to the brimstone. and they’re allowed to stay dahil someone still has to do the mundane and the nitty gritty, the everyday boring stuff like filing documents, checking forms, forwarding consignments, directing traffic of goods and merchandise, etc. these are the ones outside the inner circle, nasa periphery lang po sila but much needed to give semblance of what customs is supposedly about. the ones that threaten the inner circle are transferred if not demoted, but rarely fired dahil there’s no telling they wont kick up a stink, go to the media and expose the whole shebang, then the inner circle’s existence could well be in jeopardy, brought out to the open and gossip will spread, innuendos can kill careers. if court case follows, nah, the inner circle would not want delays and undue disruption of extracurricular activities and lose millions and billions in the meantime. they could bribe courts though and have cases thrown out, but bribe will only get higher and higher once lawyers and judges wise up, kaya best interest ng inner circle is to work under the radar and not bring any attention to themselves. many of the harmless in customs are kept out of the loop and have no access important info, not close friends sila ng inner circle and not allowed to share in the wealth. greed is god in customs, there are ‘atheists though. but if they proved to be promising, they could well be let in but not everyone is invited sa inner circle. it’s like the ku klux klan, membership is by invitation only. the GUARDs at the perimeter GATES of the BOC premises where ALL CONTAINERS shipments PASSES through OUT of the BOC area, – are IN-THE LOOP of the dumi-corruption. the GUARDSs are richer everyday. Expensive items for them like real estate lots, cars, etc., they can buy easily at periods of time in every year. There is HALT! Who goes there? What is the PASSWORD? Password is: Money here! Does BOC have CCTVs at these 24/7 monitored at the GATES? What’s next after MAGNETIC LIFTERS? Fake Thousand rounds for Cannon shells for 105mm CANNONS? Fake Million rounds of Ammo for rifles? Fake Thousands of Grenades? What else besides fake magnetic lifters? THINK. Imported good looking fake COFFINS? All of these and above loaded with SHABU or illegal drugs. For the new TEAM at BOC = THINK = to have intelligent nuts to know. Kung meron man “outside the loop” sa BOC ay kunting kunti lang. Mas marami ang kaparte ika nga. Dahil kailangan lahat ay damay para di sila magsumbong/bumaliktad. Malakas ang loob ng bawat isa kasi alam nila yung mas mataas pa sa kanila kasali din. At alam ng lahat na yun maliit na babaliktad ay sya maiipit pag nagkabukuhan na samantalang ang mas mataas pa ay lalabas na malinis. Kaya sino ang maglalakas ng loob na magsumbong? Kaya kadalasan sa mga empleyado sa gobyerno na meron katiwalian sa departamento nila ay dalawa lang ang pagpipilian, 1. Sumali ka/Makinabang ka at maging pipi at bulag sa mga nangyayari sa paligid mo or 2. Umalis ka para di ka madumihan or madamay pero paano ang pamilya mo? Paano ang maraming taon na serbisyo mo? 3. Takutin ka o pamilya mo. Paano ka makakapgtrabaho ng maayos kung palagi ng may banta syo o nakabantay sa mga kilos mo? Hindi pwede ang alam nila na alam mo ang nangyayari sa loob at hayaan ka na lang. Delikado yun sa “operasyon” nila. Kaya nga balik uli sa simula dapat ang mamuno ay malinis, matapang, at tapat. Meron pa kaya nito??? he he he. Mission Im-possible? ? ? guys, isn’t that what duterte wants us to believed that customs is totally kurap and uncontrollable kaya he’s sending in the final solution: the military? let’s be careful with generalisation for it erodes human rigthts. god save a city for the sake of the righteous few. generalisation: at school, children from 10yrs are all to be drug tested na. maybe if duterte’s grand children set the example and also let themselves be drug tested, children all over the country will follow suit. it’s not so scary, see? if duterte’s grandchildren can do it, the rest can too. and now, female students in baguio doing health courses are to be pregnancy tested as well. yay, pano yong lesbian? how are they supposed to be pregnant? dapat exempted sila. women with the medical condition endometriosis can barely get pregnant and should be exempted too. uhm, if women get pregnant a month or two after they’ve been tested, what then? college admin would just have to have pregnancy testing done every month! drug testing of all school children, d’you know how much that will cost the nation? pregnancy testing of female college students, who’ll foot the bill? will it be the students themselves, the money taken from their bursary? the college, or the govt? where am I? ah, customs, talking about customs ako, na derail lang po. sorry. not all in customs are kurap, that’s my view. and hopeful po ako that the righteous few in customs will stay that way. Mahirap talaga linisin ang kahit ano sangay ng gobyerno. Parang nagwawalis ka lang sa bahay. 1. Kung pawarde-warde magwalis ang dumi sasabog lang or pupunta sa sulok pero anduon pa din. Pagdaan ng mga araw kakalat uli at dadami pa.
2. Kung nagwawalis ka nga pero may mga kasama ka sa bahay na nagkakalat naman pagkatapos mo magwalis, ganuon din may dumi pa din. 3. Mas malala pa kung wala talaga nagwawalis di patong patong na dumi na yan at nagkalat na. begging your pardon po, there are dumi that are biodegradable and dissipates with time. nature has ways of dealing with dumi, humans too. likewise, we take shower everyday and get rid of our own libag. we wash our dirty clothes too, and still they get dirty, and we wash them again. and the cycle goes on. life and death, love and hate, rich and poor. as for walis, gotta know first where the dirt is before engaging the walis. sometimes, if the dirt is humongous and cannot be cleaned by walis alone, cleaning team is needed. team with state of the art cleaning tools, specialist knowledge backed by years of experience. si mukhang uling nga po, no specialist derma treatment works for him. he got the dark mark of cain who ejk-ed of his own brother, abel! he, he, he. BE CORRUPTED just the same. Bribe MONEY is money bribe to make a poor general or generals rich in life. PRRD can send in a lady GENERAL also from the AFP. It won’t work at all. She’ll be just corrupted as well. BOC = Bureau of Corruption. Many causes why this corruption exists and continues at the Bureau. BOC watchers’ eyes gets blinded. Ears do not function. Minds become numbed. Feeling is failing. Smell gets lost. Only the sense of taste works! Taste of corruption. Soldiers will be sacrificed as scape-goats at the BOC. It won’t work. Why? It is simply MONEY bribe. Bribe money is so effective in CORRUPTION. Every one succumbs to it. They become JUDASES. Judas sold that perfume for its money worth. He was like the first BOC watcher for all money donated and given to him to keep. He helped himself to it profitably. Jesus, Peter and Company couldn’t believe it to their dismay. Disappointing in Jesus’ group. A judas in their Bureau! Judas self promoted himself to the ropes at the branch of a tree. But here at the BOC they really gets real promotion to other posts for job well worst done! That’s how it is. BOC = Bureau of Corruption. It is a bureau of Judases. Nothing new even with generals. Many former AFP soldiers, retired or not, will be General Judases to come. If and when there is no investigation, no charges and no trial in court or anywhere else to find out the corruption, in the Senate or Lower House or in the courts, every Judas gets to escape. Why? Protecting the Judases is a must to hide the corruption. There is no rule of any kind at the BOC. No rule of law. What is there is the role of corruption. Bribe money. Money. So? The haves and have-nuts will continue to have access to SHABU SHABU SHABU. Continue to kill at random the HAVE-NUTS in EJKs. Not so many yet to the HAVES. PNP cops are careful to the latter but not to the former. This BOC topic is long long long to finish line. BOC – Bureau of Corruption has no end in sight. Hmmm. Perhaps you are right about what BOC stands for. Palala ang corruption hanggang naririyan si Duterte. santo rodrigo is patron saint of the corrupts, h e, he, he. long long ago, thieves used to carry coal on their person, lucky charm sa kanila yang coal. dark as shadow, their thievery unnoticed in the night. ahem, santo rodrigo does not need to carry coal on his person, it’s already on his face for all to see, he, he, he. kaya nanawagan po ako kay santo rodrigo to show miraculous power and answer the question, how many magnetic lifters have been imported into manila since he has come to power? with his infinite knowledge santo rodrigo should be able to tell us what happened to the tons of smuggled shabu, the men and women behind the illegal importation and how the shabu was dispersed. the tattoo of the fish, fish being the sign of christianity, santo rodrigo’s chidlren have them. show christian mercy po, and answer the question. There could have been thousand of tons of shabu entered in the country undetected during the first year of Duterte’s presidency. The culprits must have changed tactics by allowing a portion of the illegal trade to be heralded in the media as seized, conveying the notion that the war on drugs is paying dividend. Double dipping ang labas…nagka-pera na, sikat pa sa taong bayan. corrupt people in customs have to hit the wall sometimes and they did, naging complacent kasi, sobrang asa sa impunity at nagpabaya. they should have shoot the dogs, lol! anyhow, not all in customs is bad, and when they’re bad, they’re worst of the worst. having military hunta sa customs, ahem, military has got plenty to learn, customs lingo is technical and need to be understood asap. military has to be schooled. there is difference between tariff and excise, who issues what, which office issues what? what’s bill of lading and how is the fee worked out. and these are just the very basic. the military is famous for its yessir! yesssirrr! and saying yes to many things they dont understand is foolish to me. then they got paid for military duties, and then, they got paid again for doing customs duty, santa maria! the military has hit gold mine! double dipping na. twice highly paid for doing the job they could barely do. the military still has hot cleared marawi city of ordinances, isang taon na ang nakalipas. and now, off to customs na sila. yessir, yessir, yes to everything just to shut up mukhang uling, he, he, he. too tedious listening to him kasi. it takes around 2-3 yrs of studies to be customs, if santo rodrigo thinks the military can be customs in one day, santo rodrigo had it coming! 4. To repeat all calls from posts more distant from the guard house than my own. 5. To quit my post only when properly relieved. 12. Do not watch. Do not challenge any person near your post. Allow everyone to pass with corrupting money. That is the authority. see no evil, hear no evil, talk no evil. and to keep up the pretense! keep them guns shiny, uniform pressed and buttons well polished, to look formidable and the war in nearly won! and so the soldier on duty does his job, back ramrod straight, voice commanding, gun slung on the shoulder, uncocked dahil walang bala, he, he, he. and soldier is uber happy, doble ang sahod, e.